Skiers going up on the chairlift against bright blue sky- ski resort in Italy on sunny winter day. The terrifying moment was caught on camera as an eight-year-old desperately tried to hold on to a ski lift. Five young skiers are being called heroes after their quick-thinking helped a boy dangling off a ski lift in Vancouver. The terrifying moment on Grouse Mountain was caught on camera Wednesday afternoon. 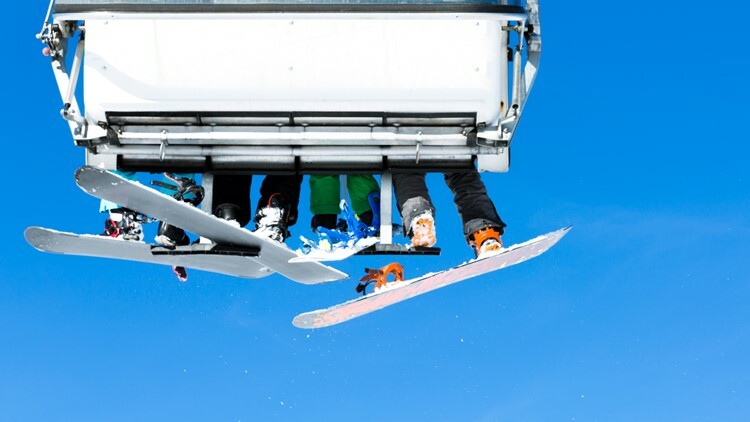 In the video, you can hear a young boy screaming for help as he desperately holds on to another ski lift passenger, believed to be the boy's father, according to a report by Global News. One witness told Global News that they heard the boy screaming just a few seconds after they got on the lift, but the chair kept going up, until it eventually stopped. From the video it appears the boy's father may have been having trouble lifting him back onto the ski lift because there was another child between them. That's when a group of British Columbia teens sprang into action and grabbed a piece of out-of-bounds netting from the hill to try and cushion the boy's fall. The eight-year-old wasn't hurt, but was taken to the hospital as a precaution, according to a statement from Grouse Mountain Resorts, which said that the incident is under investigation. "Grouse Mountain is incredibly appreciative of those who assisted in Wednesday’s chairlift incident. Their quick thinking and immediate actions are commendable," according to a statement from Julia Grant, Grouse Mountain's Communications Manager. She added that they are providing the teens involved with the rescue free season passes.